CD. JUAREZ — Thousands of Juarenses gathered at the Chamizal Park during a month of Fiesta Juárez as this city continues to move away from a dark decade of violence forward to family fun and entertainment. Fiesta Juarez offered music, sports, mechanical games, a circus, rodeo, charrería and art exhibitionsfor in September and October. Performances were spread out over three different stages at the fair. Foro fiesta de las estrellas where national and local artists performed. Foro circo, for circus acts, theater presentations and conferences. Foro Rodeo included rodeo, country groups, boxing and wrestling events. Larger musical acts such as grupo norteño Los Tigres del Norte, Conjunto Primavera y Los Huracanes del Norte, solo singer Marco Antonio Solis as well as pop duo Ha*ash were showcased in El Palenque, located across the street from the fair. 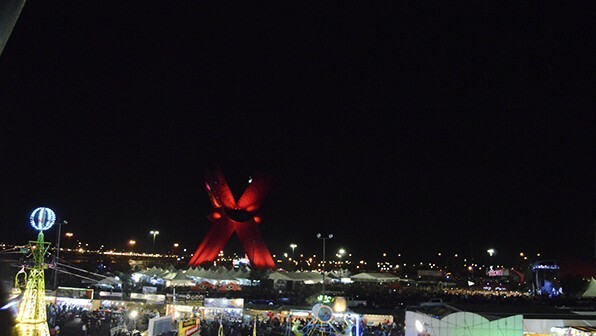 Fiesta Juárez ran from Sept. 25th to the 18th of October. 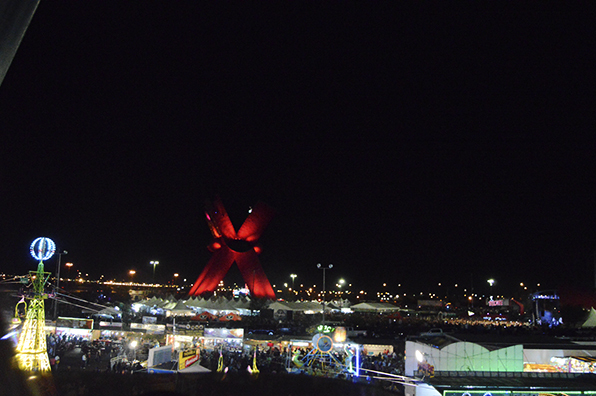 The second year Juárez has offered Fiesta Juárez located at the Plaza de la Mexicanidad in El Chamizal Cd. Juárez, Chihuahua México. There was a five year absence of events such as this one because of what became known as the war between drug cartels in Juárez. Gilberto Cueva Pizarro, the president of the committee in charge of organizing the event said they expected about 500,000 people to attend the fair. This number includes those families from Juárez and as far away Chihuahua City and visitors from Texas and New Mexico. “Even for those who are still a little bit scared about being in Juárez, I think that this atmosphere really helps them be more relaxed and lets them have fun,” said El Pasoan Marco Garcia. Other attractions included Wrestling AAA, with the participation of wrestlers La Parka, Místico, Payasos AAA, El Texano JR., Pentagon the son of Fantasma and others. 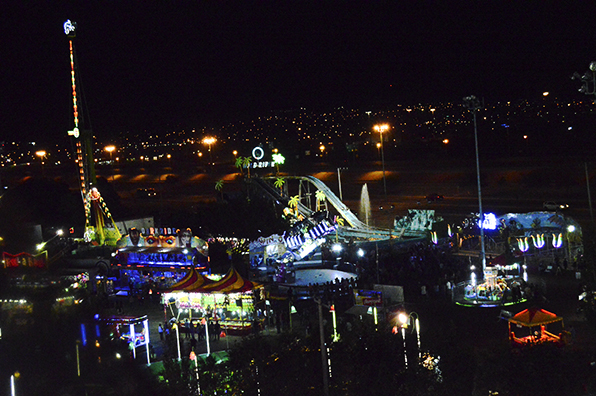 Spokeswoman Rosario Coutiño said that Fiesta Juárez expanded this year to offer 44 different types of mechanical games and five thrill rides like the popular Mega King Tower, which is 88 meters tall and has a drop of six seconds. Like any good fair Fiesta Juarez had no shortage of festival foods with a total 43 modules of food which offer antojitos mexicanos. Like tacos, enchiladas, gorditas, burritos, chilindrinas, hamburguesas, papas fritas and elotes as well as soft drinks, beer and alcoholic beverages. Collaboration of Wing’s Daddy and Peter Piper Pizza as well provided with their trademark flavors. 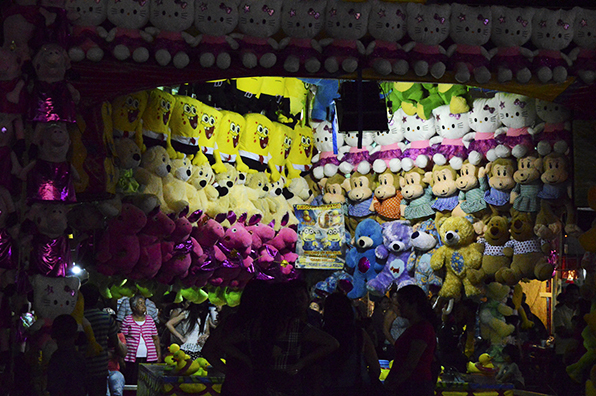 Children and adults lined up to enjoy amusement park rides and games, such as El Juego de los patos. A game that requires participants to toss rings onto the necks of sitting ducks. “I think this year its going to be better; it already looks way better than last year’s.” said Roberto Alvarado, a Juarense who brought his family to opening night. El Gobierno Municipal provided 7 million pesos and the state of Chihuahua provided 15 million pesos in order to make this event happen. Both last year and this year the event cost 22 million pesos. “The money collected would be used to pay for the work of Fiesta Juárez and to begin the works of the project for 2016. There is also a portion destined towards space improvements at the Plaza de la Mexicanidad.” Coutiño said. Approximately 1000 police helped provide a sense of security. Officers, cadets and security guards monitored points of entry and strolled throughout the fair. More police held vigil in trucks and cars in the area outside the fairgrounds.elements. First aid personnel were also on hand for any medical problems. Karla Hernández said the fair was a fun way to spend time with her boyfriend. Kimberly Cossio is a multimedia journalism major at UT El Paso.